First of all, some news about the Diary. I’m afraid it will be late again. My plan was to to finish and proof it this last weekend, chuck it at the printer today and have it ready for posting off at the end of next week. Hah! Thursday, I was shifting some furniture and my back went. Slipped disc apparently. Anyway, it’s blooming painful and I’ve been flat out in bed ever since, unable to get to my computer. I’m writing this on a little tablet thingy by the way; I’ll be getting a laptop ASAP so if this happens again I can at least carry on working. Work on the D was further delayed earlier this year by my having cataracts; one has aready been fixed very successfully, and the other will be done by Christma. My sight is already improved. If my back improvement continues, I should have the D at the printers next week; I’ll pay them for a fast turnaround and with any luck they’ll be in the post mid-November. I think you’ll agree with me that 2016 has been a pretty strange year so far. Have a good Samhain, if you celebrate it; and let’s all try to make 2017 a better year in whatever way we can. Last year’s softback diary was pretty awful quality, I have to admit; it’s one of the rasons I’m using a new printing company this year. They’ve just sent me some samples and I’m impressed with the quality of their paper, binding and card. The softback, at least, will be much better this year. Happily, their prices are also cheaper – which means that I can reduce the softback price back to £9.99! I’m still looking at finishes for the hardback D, but i don’t expect to have to put any price increase on that. The same goes for the Desk Diary, btw. I’m now organising the 2017 Diary, and making some changes. I’ll still be selling Elfin T-shirts, but I’m adding a range of non-Elfin Ts. A couple of examples are posted here. There are several more designs to come, including a set of Zodiac signs. I may even be selling Elfin mugs as well! Oh, I’ve not forgotten the Diaries – they should be ready sometime in October. It will be a bout three weeks or so until i get an idea of prices; when that happens, you will be able to pre-order them here. So stay tuned…. Better still get on my mailing list (see right). I’ve now just wrapped up the last of the current stock of hardback Ds, and have about 6 softbacks left. But I had already ordered reprints of both before Christmas – they should be here next week sometime. So you can still order a Diary; just be prepared for a wait. I still have plenty of Desk Diaries, and of course unlimited supplies of the PDF Diary. It seems that the flood danger is over for now. However, there is still considerable disruption to services in Dumfries & Galloway, so I won’t be posting out anything until tomorrow (Saturday). The postal services may or may not be working then – they weren’t working last Saturday – and Monday will be a holiday here in Scotland, so they won’t be working then. Sorry if you’re waiting for a Diary to arrive, but I can’t change the weather, or holidays! I won’t be able to deal with any orders for a few days, perhaps not until next week. The storms have affected our area quite badly, we are in a flood danger zone and more rain is forecast. There is no postal service. This morning the river alongside our property briefly burst its banks and the water got up to our doorstep before going down. Most roads are closed and I’m concentrating on making my home flood-safe (half the garden is currently under water, despite the drop in water levels). So thanks for your patience and have a good New Year! 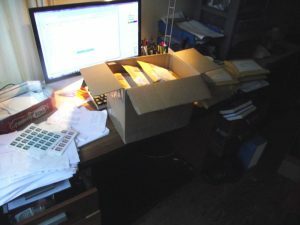 The softback Ds arrived last night (yes, a Saturday night), so today I’m busy packing up Ds ready for posting tomorrow. Hopefully, the desk Diaries will be here tomorrow. There’s hundreds of orders, with only me & Hubby to deal with them, so some of them inevitably won’t arrive before Chrimbo. Sorry about that folks; this year, it couldn’t be helped. But I’ll be more organised next year. I’m even thinking about doing the wall calender again! Anyway, I’m dealing with the earliest orders first, and the ones I know are meant as Chrimbo prezzies. The people who haven’t paid for their Ds within a month after ordering will be left until the very last – when there are unlikely to be any Ds left anyway! Well, the hardback Ds, at least – I’m still waiting for the softbacks and the desk diaries. I’ve actually sold out of hardbacks and softbacks and have got more on order. The print-on-demand service I’m using is good – although the initial printing is taking over three weeks, any reprints are apparently done in a day (or so the man says!) It’s more expensive than my previous printers, but so much faster! I’m busy wrapping up and posting Ds, but I’ve finally found time to tweak the website. I’ve found a new woprdpress theme that looks great with only a few adjustments; I’m forced to admit that it’s much nicer-looking than the design that I created myself. I’ll start posting more Diary pictures as well, as soon as the other Ds arrive. I got the Diary PDFs to the printer so late that wasn’t time for them to send me a hardcopy proof. They’re slightly different to the old Ds – the softback D will have a full-colour cover, and the hardback D is a proper bound book. It looks very smart. Hallo all Efin Diary peeps! Well, it’s been a bit of a year here at Elfin HQ. I’ve had to say goodbye to my printer at rather short notice (I’m not going into the reasons) and the financial situation has been dire. My chronic health problems haven’t been helping either. But I’m still here and I’m determined to bring out the Elfin Diary once again. It’s going to be late again, I’m afraid – I anticipate I’ll have the first copies ready at the end of October. Unfortunately, as the one good thing about my old printer was that he was cheap, I’m going to have to raise the prices of the Ds. The new prices are: hardback £17.99; softback £11.99; desk diary £16.99. You can pre-order them from the website now. There will be a PDF version at the usual £5.99; but that isn’t ready yet. There will be incense – I’m waiting on a shipment of Fern & Moss. The price is the same and again, no postage will be charged for incense alone. There will also be T-shirts – I’m awaiting the arrival of those as well. The postage on the Ds and the Ts will be the same as last year – £1.50 per order. Now, is there any good news to report? Most of the trees I planted in the garden this year and last year are still growing! That’s several fruit trees, two oak trees, a beech tree, a weeping willow and a cherry. Seeing that lot – and the other trees I intend to plant next year – grow into a woodland will certainly be an incentive to stick around for as long as possible! Honestly, I’ve found that planting a tree is extremely therapeutic and positive (and yes, I do go out and talk to them as well). So if you have some garden space, why not plant a tree yourself? The Woodland Trust will be happy to advise you on all aspects of trees and tree care; under some some circumstances they’ll even pay part of the cost of planting a small woodland. Go to woodlandtrust.org.uk, write to them at The Woodland Trust, Kempton Way, Grantham, Lincolnshire NG31 6LL or ring them on 0330 333 3300. Well Diary peeps, I have to apologise – the D is going to be late again. I hope to have the first Ds for sale around the end of October. The bad news is that the price will have to go up – I’ll explain the reasons in the next newsletter. The D covers will also be a bit different – only the hardback and the desk diary will have the usual foil-block covers; the softback D will have a coloured laminated cover. Sorry about this, but its been a difficult year here at Elfin HQ – I even thought for a while that I wouldn’t be able to keep the Elfin Diary going any longer. Anyway, enough of the whinging – the D is going to be published!